#99-Carl Edwards scored his first victory of 2008 in the rain-delayed Auto Club event, coming out of nowhere on Monday to drive past the fleet Hendrick Chevrolets of #24-Jeff Gordon and #48-Jimmie Johnson in the final 20 laps. 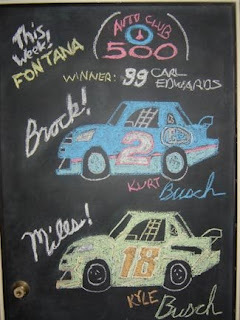 #99-Carl Edwards led 64 laps en route to his first California victory. 2) #48-Jimmie Johnson The leader when the race was postponed until Monday after 87 laps. On Monday, an 18-second pit stop for a nearly-missed lugnut cost him track position which he made up with interest. Led a race-high 76 laps. 3) #24-Jeff Gordon Opened up a two-second lead over the field after the first 5 laps on Sunday despite overheating concerns. Was still competitive on Monday, racing side-by-side with teammate #48-Johnson, but ultimately could not contend with #99-Edwards. As it turns out, his engine blew on the final lap of the race, but as the field was frozen and he made it to the line, still finished in third. Led 68 laps. 4) #18-Kyle Busch Had his hood up in the pits at one point on Sunday, but recovered very nicely to be one of the strongest cars that day, racing up to 7th on lap 67. Scraped the wall off turn two early on Monday. Led 14 laps. 5) #17-Matt Kenseth Slipped back early on Sunday before making an unscheduled stop for overheating on lap 11 due to a massive amount of debris on his grille, his car spraying water on pit road. Led 4 laps. 8) #29-Kevin Harvick Lost a lap early on Sunday when he was forced to pit for an overheating problem due to debris on his grille just when #11-Hamlin brought out the caution. The move forced him to start at the tail end of the longest line. Led 1 lap. 9) #9-Kasey Kahne Saved his car from spinning early in the event on Sunday and was solidly in the top 10 on Monday. Led 1 lap. 10) #12-Ryan Newman Stayed out on old tires on Monday and wound up smacking the outside wall just after losing the lead to #17-Kenseth. #12 was driving 205 mph into turn 1 at the time, but the contact did not bring out the caution. Led 3 laps. 11) #83-Brian Vickers Took two tires along with #26-McMurray and #8-Martin and scored the best finish of the three. 12) #31-Jeff Burton Brought out the race’s eighth caution (and the first on Monday, seventh was for rain) when he scrubbed the outside wall and was forced to pit for a loose brace under the right-rear of his car. Nearly collided with #38-Gilliland off turn four. Led 2 laps. 15) #16-Greg Biffle Was excited to the point of giving “war whoops” over the radio on Sunday since his car was running so well, but was unable to contend on Monday. 16) #8-Mark Martin Started and finished his 700th Cup race, taking two tires on the final round of stops with #26-McMurray and #83-Vickers. 17) #38-David Gilliland Nearly collided with #31-Burton coming off turn four. 18) #7-Robby Gordon A second-straight solid finish as his sponsor, Jim Beam, began its “Rally for Robby” program to help the team recover from its costly Daytona penalty. His near-spin on Sunday caused the race’s seventh caution when #19-Sadler checked up into the outside groove and spun himself. Led 1 lap. 22) #26-Jamie McMurray A two-tire stop along with #8-Martin and #83-Vickers in the last set of pit stops gave him good track position, but he had to fight the car to the finish. He nearly spun out of the 9th position at one point, but managed to save it with an impressive drifting maneuver in turn two. Led 2 laps. 24) #19-Elliott Sadler Brought out the race’s sixth caution when he ran too high on the track checking up for the faltering #7-R. Gordon. The move caused #19 to spin and crunch the rear of his car. Still managed to get his lap back on Monday, only to be felled again by overheating problems as his car, too, pushed water. 28) #55-Michael Waltrip Lost a wiggins clamp during the pace laps on Sunday and sprayed a massive amount of oil around the track, delaying the start even further between the rainstorms plaguing that day. On Monday, he brought out the race’s ninth caution by spinning out and wrecking. 31) #01-Regan Smith (R) The highest-finishing rookie of the race for the first time in 2008. 32) #40-Dario Franchitti (R) Led 1 lap. 33) #44-Dale Jarrett Had his hood up in the pits at one point on Sunday. On Monday, he brought out the caution when the right-rear tire on his car came apart, and then spun out on the final lap to bring out the race’s twelfth and final caution which forced the race to finish under yellow (tenth and eleventh cautions were for debris). Led 3 laps. 34) #78-Joe Nemechek Blew a left-rear tire in turn four and spun, nearly collecting #01-Smith and #22-Blaney in the process to bring out the race’s fifth caution (third and fourth were for rain and debris, respectively). 35) #34-John Andretti Led 1 lap. 36) #28-Travis Kvapil Gambled for good track position on Sunday by securing a good re-starting position just before the lap 87 postponement. Breaking the splitter on Monday, however, cost him valuable time. 37) #41-Reed Sorenson Sustained damage to the rear of his car after being spun in the #5-Mears/#88-Earnhardt, Jr./#77-Hornish, Jr. accident off turn two. 39) #70-Jeremy Mayfield Brought out the race’s eleventh caution by smacking the outside wall. 40) #88-Dale Earnhardt, Jr. After four straight California DNF’s, this race was just as bad as he was clipped by the spinning #5-Mears on Sunday’s seeping track, sending his car flush into the wall with the driver’s side. Earnhardt, Jr. was angry, but okay, and returned Monday to finish. 41) #11-Denny Hamlin Slipped in some of the water seepage in turn three and smacked the outside wall to bring out the first caution of the event. 42) #5-Casey Mears Spun off turn two after running straight through a large wet patch on the track where seepage occurred to bring out the second caution. Mears’ car spun around and clipped a passing #88-Earnhardt, Jr. in the process, ripping the side off the #88 and sending him into a spin. Mears was then broadsided by #77-Hornish, Jr., which sent Mears in a lazy roll on the backstretch that made the car land on its passenger-side window. 43) #77-Sam Hornish, Jr. (R) Collided with #5-Mears on the backstretch in the second caution to send #5 into a lazy roll. A small fire ignited in his engine compartment, but was quickly extinguished.